Only our hotel guests can use the wellness area! 15-meter swimming pool is ideal for relaxation or for the lovers of swimming. 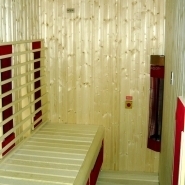 The high temperature (80-90 ° C) and low humidity (10% maximum) level provides the refreshing effect of the sauna. 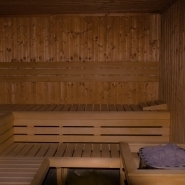 The Finnish sauna is good for the heart and circulation and helps in detoxification. Sauna has a tranquilizing effect to your brain which promotes deeper and more intense sleep. As part of the suns invisible radiation spectrum, the far-infrared light easily penetrate human tissue, which is resulted natural resonance with countless beneficial effect. The using of the infra sauna is more pleasant because the air temperature is lower 8only 40 to 55 °C) than in Finnish sauna. Those, who feel uncomfortable the dry heat of the Finnish sauna, there is more advisable for them to sweat in the steam room. In case of proper use of the steam room it has several beneficial effect. It has relaxing and anti-stress effect, good for respiratory diseases and also mitigates rheumatic complaints. The wellness department is open from 7:00 to 10:00 hour and 16:00 to 20:00 hour daily. On request we make available our wellness department outside the above mentioned periods, as well. When not recommended to use the wellness department? • In the case of open wounds and certain skin dis.